Inflatable tents what sort of tents are in the marketplace? Inflatable tents were possibly, once a long time ago, scoffed at. Who would want to sleep in a tent that could collapse on you thanks to a wayward stick! But tents and technology have come a long way. These days, many tents are all about speed in putting up, and minimal fuss. Inflatable tents meet a need in the market - that of no fuss, less worry, no poles, and no experience required. Naturally, bringing along the pump is the crucial part of this tent set up. They use stronger material than the average inflatable you might have around the house (!) and because of the better material, the cost goes up. The beams which support the tents are crucial, so you will see each brand has all this different technology/design to keep the tent up, with different terminology to describe that design feature. Of course, you may have to deal with a puncture which could cause issues in the middle of the night, but think of your tent pole like a bike tyre - it has an an inner tube, which is where the puncture would need to be fixed. Highly recommended to use ropes and stakes, regardless of the weather conditions, but from all reports, once staked out, these tents perform very reliably in poor conditions. Without them, I can see tents blowing all over the campground which wouldn't be ideal for anyone. This story was put together initially, about 5 years ago. The tents weren't even in Australia then (well, rarely). Now, we can readily access them thanks to online shopping. So this is an updated look at 5 inflatable tents that are available to buyers right now. None of these tents are what you would call inexpensive, but if you are the sort of camper who loves camping and wants to do without the issue of poles, then you might want to review these. Please note: Whilst we have listed these tents, we do not sell them but have, where possible, listed links so you can investigate further should you want to know more. The Vango tents seem to be one of the leaders in inflatable tents. They have been around for a while, so you know they must have something going for them. 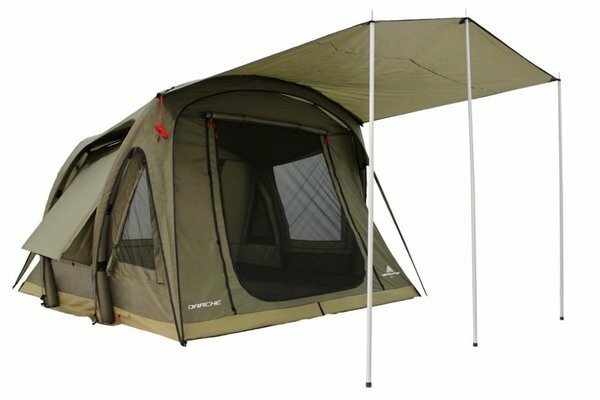 The new Vango Solaris 600 Airbeam Family Tent is a three beam Inflatable tunnel tent that is perfectly suited to shorter breaks and longer holidays with friends or family. The Solaris' pre-bent AirBeams ensure that it is quick and simple to pitch as well as boasting impressive headroom in its living quarters. 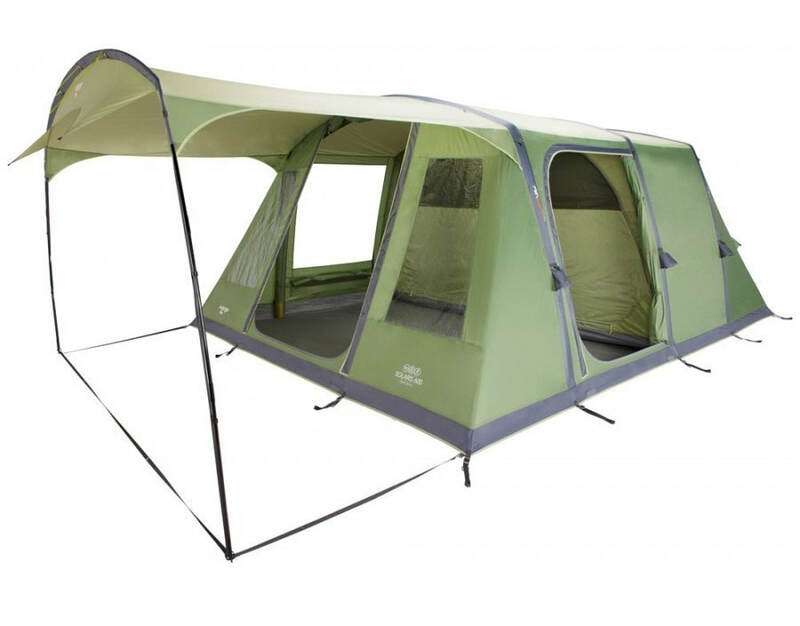 Also included is the huge pre-attached sun canopy, which effectively doubles the living space in the tent, allowing you and your family to relax and enjoy the outdoors. Black Wolf in Australia has a range of inflatable tents along with all their other canvas and nylon tents. Black Wolf was one of our first tents we owned, and they are good quality. These inflatable tents do come in a variety of sizes, based on the number of people you wish to accommodate. There is the 11 person Turbo Twin - full details and pricing here (its frequently on sale so keep an eye out for a sale) . It has a main 3x3m room, and then bedrooms either side. I wouldn't put 11 people in here, but a larger family would definitely appreciate the space and ease of use. ​If 11 people sounds excessive, the 8 person tent (below) may be a better option. This would fit 5-6 people comfortably. Like the previous tent, frequently on sale. Bushranger is a supplier of offroad and 4WD gear and have entered the market into inflatable tents as well. The Bushranger Bluegum is a dome style design and features two strong and sturdy integrated air poles, and with 8 tent pegs to replace guy ropes issues. We use dome style tents a fair bit, so this one does appeal to me in terms of how it looks and practicality for a family (once again, like the Kampa, it is more for the recreational user as opposed to the NEMO Gogo, which is designed for individuals who have to carry their tents). This is one of the cheaper tents in the inflatable market, and this 3-4 person inflatable tent would suit those who want a fast set up, but without a hefty price tag. This tent is designed not for the family but more for couples I think. Zempire is New Zealand company which has grown to be throughout the world, and available here in Australia. They do a wide range of products, should you find this one not the right one for you. I hadn't even heard of Darche until researching this story on inflatable tents. At first glance, the above tent, looks very much like a Black Wolf tent, so don't get confused! Below is the Darche set up in action. Looks good!! !